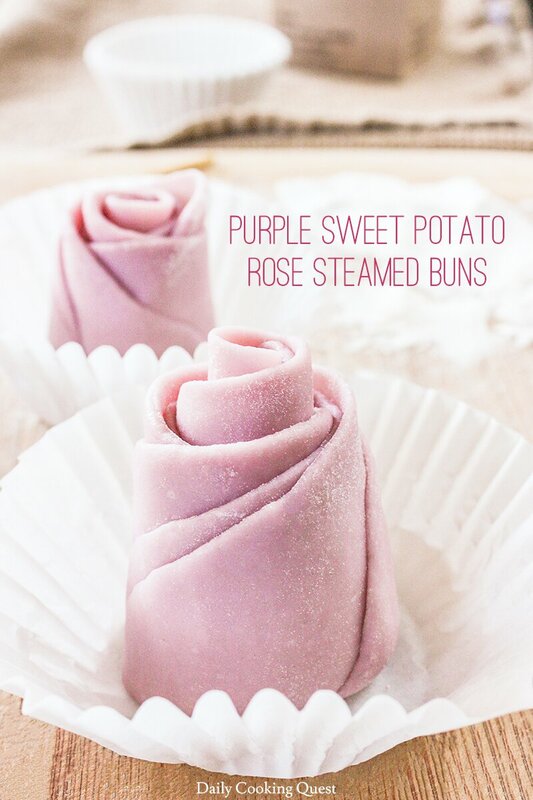 Purple rose shaped Chinese steamed buns (mantou) recipe, with a step-by-step guide on how to create the purple dough and shape the buns. How can anyone resist freshly steamed Chinese steamed buns, let alone one shaped in rose, and come in light purple and bordering pinkish hue? After saving so many of these recipes for a long long while in my Pinterest board, I finally took the plunge and make these babies. Verdict: taste really good, soft fluffy texture, and most importantly, cannot suppress the smile as I bite into the soft fluffy purple/pink rose buns. Preparing the dough for purple steamed buns. You need to shape them into roses, which took me 3-4 times longer than regular round steamed buns. So time yourself accordingly. Having said that, it is not actually that hard to make these, so let me guide you along the way. How to make rose shape steamed buns. First, steam some purple sweet potato. While your sweet potato is being steamed, you can prepare other ingredients. My next step is to mix warm water with yeast and sugar and let it sit until frothy and foamy. Then, I weigh all my dry ingredients (cake flour, baking powder, sugar, and salt) and place them in a mixing bowl. And don’t forget to weigh your unsalted butter too (you can use shortening too). Once everything is ready, take out sweet potato from steamer and mash with a fork. Make a well in the dry ingredients, add mashed sweet potato, and yeast solution. Knead into a smooth dough. Add unsalted butter to the dough, and knead until dough is not oily. At the end, it should be smooth, soft, and elastic. Place in an oiled bowl, cover with wet kitchen towel/saran plastic, and proof until doubled, about 1 hour. 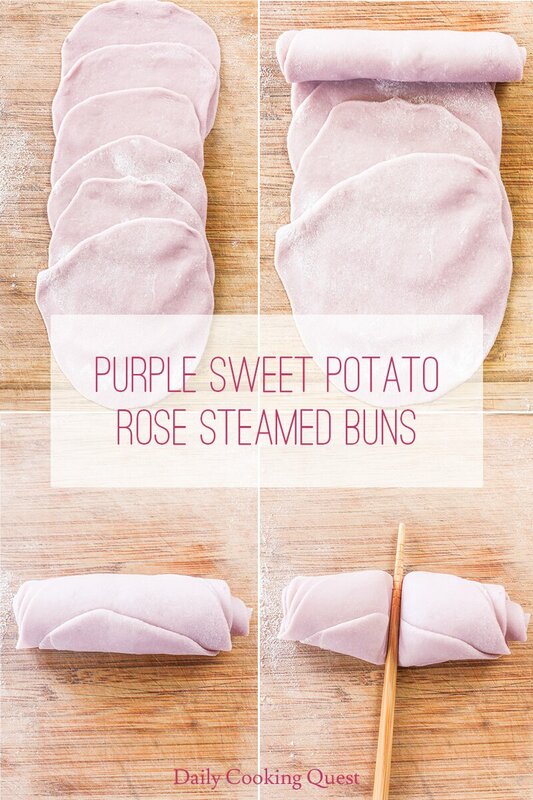 Purple Sweet Potato Rose Steamed Buns. Just shaped and prior to proofing. Once it has finished proofing, punch the dough to release air bubbles, and knead for 2 minutes. Make 15 gram dough balls. You will need 6x15 gram dough balls to make 2 roses. For a detailed instructions on how to shape the rose, please refer to my step-by-step photo. My dough yields 36x15 gram dough balls, which give me a total of 12 roses! Place each rose in a cup cake liner. Once you are done shaping the roses, let the dough proof again for 45 minutes. 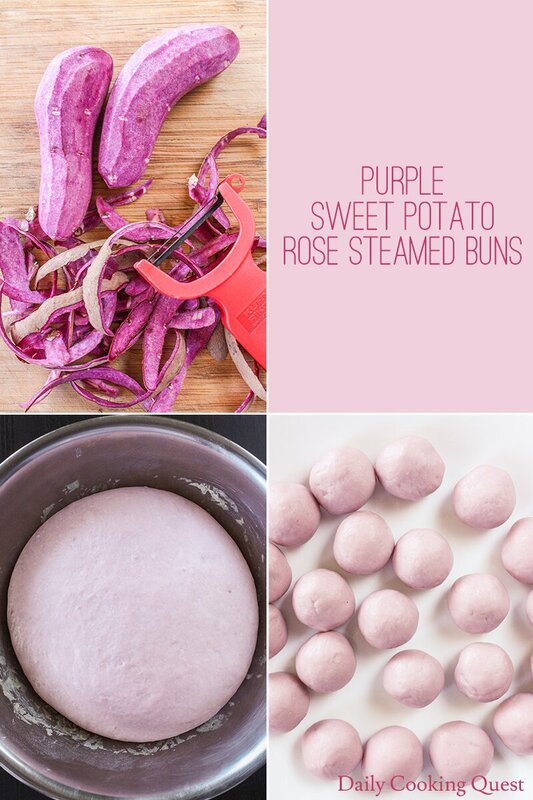 Purple Sweet Potato Rose Steamed Buns. After proofing. My steamer is only one tier, and I can only steam 6 roses at a time. I chose to steam the first six that I shaped first since they have become bigger compared to the later 6. That way, in the end, all of my roses ended with roughly the same size. If you have a multi-tier steamer, you can wait until all buns have fully expanded before steaming everything in one go. The buns actually expand slightly after steaming, so don’t crowd them too much. Also, I think the color becomes slightly lighter compared to pre-steamed color. 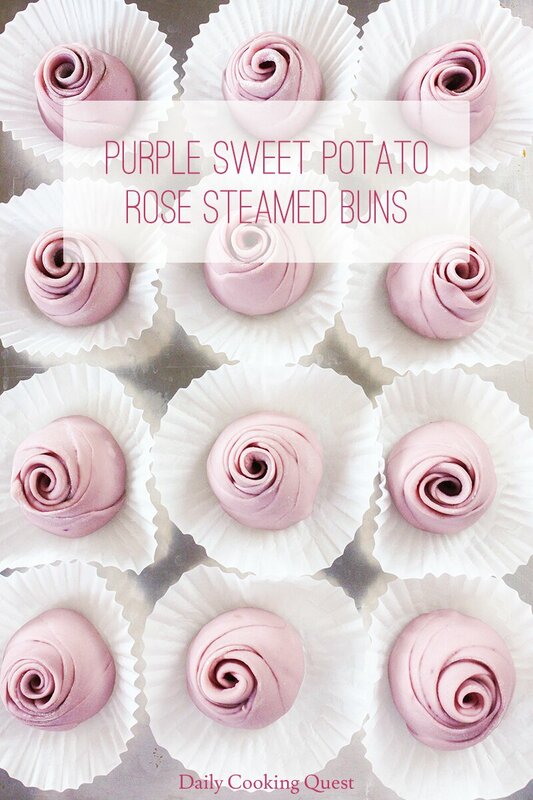 If pre-steamed is more purple, I think after steaming, it is more pink, but look pretty regardless ;) Taste wise, it doesn’t differ too much from your regular mantou (Chinese steamed buns), but the shape and the color definitely make these special. As with other steamed buns, you can freeze any leftovers once they are steamed. To reheat, simply steam again from frozen state. Alternatively, you can place frozen buns in a plate, cover with a wet paper towel, and microwave until soft and fluffy again. Your choice. Steam purple sweet potato until fork tender. Transfer to a bowl, and mash with a fork into smooth paste. Mix together warm water with active dry yeast and 10 gram sugar. Set aside until frothy and foamy, about 10 minutes. Whisk together pao flour (or cake flour), baking powder, sugar, and salt in a mixing bowl. Make a well, add mashed sweet potato, and yeast solution. Knead into a non-sticky dough, about 10 minutes. Add unsalted butter, knead again until non-oily, another 10 minutes. The dough should become soft, smooth, and elastic. Place dough in an oiled mixing bowl. Cover with wet kitchen towel/saran wrap. Proof until volume is doubled, about 1 hour in a warm kitchen. Punch dough to release air bubbles. Knead for 2 minutes. Divide dough into 15 gram portions. To shape into rose: take 6 dough portions and roll each into a flat circle (~ 4" diameter). Arrange them side-by-side, half stacking on top of one another, then roll from one end to the other end (left-to-right, or top-to-bottom, depends on how you stack them). Take a piece of chopstick and cut the rolled log into two to form two rose buds. Place the rose buds in a cup cake liner. Repeat. Let the rose buns proof until volume is doubled, about 45 minutes in a warm kitchen. Prepare a steamer on a medium-high heat. Steam the buns for 12 minutes, turn heat off, and let the buns sit for another 3 minutes inside the steamer. Remove cover (gently so you no water drops onto the buns), take the buns out from steamer, and serve hot. Wow! These are so pretty! !